Just in the nick of time, I finished the last of my Fathers’ Day presents. 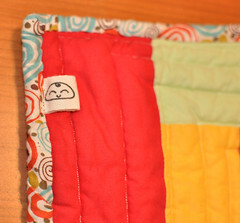 The labels I ordered arrived in the mail, so I stuck one on the wonky potholder and finished up the binding. I meant to make one more pot holder for my dad, but I goofed. I thought it would be nice to make an intentional-looking one to go with my lazy wonky one, so I followed Ellison Lane’s starflower block tutorial. 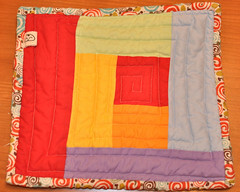 I didn’t adjust the sizes, though, so I ended up with two 12.5 inch squares. Doh! I blame late night brain. They would definitely have made nice pillows, but my dad wouldn’t want pillows, so I’m going to say they’re trivets. Heh! I also made a mug rug for my husband; I figure he can put his nalgene on it at work. 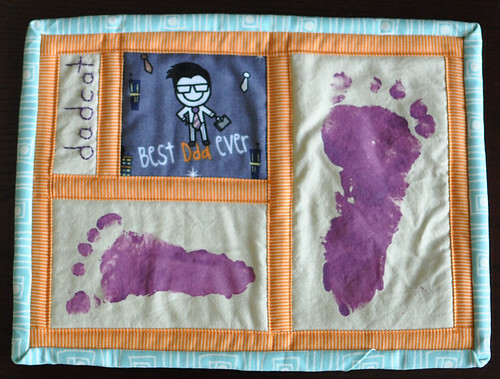 At first, I thought I’d get the kids’ handprints, but after just getting big smudges with the four-month-old, I realized that it wasn’t going to happen. 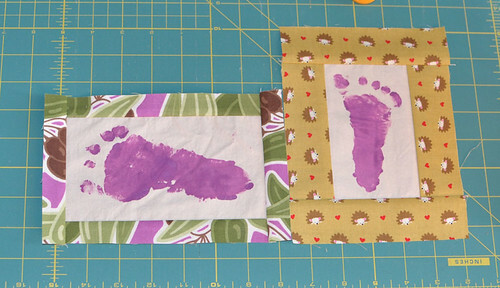 Once I had the footprints, I chose these borders because I liked the hedgehogs and I thought the purple print matched the purple in the ties in the dad fabric I also wanted to use, but when I lay the two blocks next to each other, it looked pretty awful. After one more failed border (pac man print! ), I ended up with this. Yay for being done! 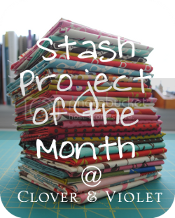 I’m linking up to Clover and Violet’s Stash Project of the Month because I made these completely from my stash. I stitched together seven pieces of batting for my dad’s potholder!